Three weeks into July and well wet on way to Woodbridge, with wipers whipping the windscreen. Parked at the Turban Centre, pulled on the Pac-a-Mac, pounded past that pet place and proceeded to the Thoroughfare. 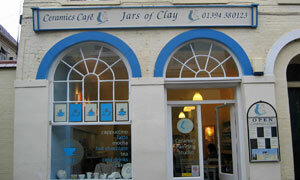 Next door to the Georgian Coffee House for this week's rhyming slang destination, Jars Of Clay. Think they pop round to each other's to borrow a cup of sugar? See them both on the map of Woodbridge coffee shops. Like the more snappily titled All Fired Up in bigtown Ipswich, JoC is a "ceramics cafe". Come in, grab some paints and a plaster figure, then exercise your creative bent. And while you're here, have a cuppa coffee with a slice of cake. Not really the place, then, for an extensive savoury menu. They've got a toaster and they're not afraid to use it. I had option 1 of 6, the cheese: unexpectedly this came in the form of two miniature blocks of Cathedral City, plus pickle. Silly me thought it would be toasted. Mais non. There was another lunchtime punter who appeared to have a plate of sandwiches. Could be she'd asked for raw toast. Moving on, you can flick through various pottery design books in lieu of the daily papers while nibbling a slice of homemade-looking cake. We both opted for a pre-packed bakewell slice, which says much about us, while my large Americano needed an appropriately large vessel to hold it. So, not the most imaginative menu in the town, but they fed us and kept us dry one soggy lunchtime. If it was a car -- Daewoo Matiz. If they were passing by -- Tony Hart.